Discover a world of peace, inspiration and spiritual energy to revitalise every aspect of your life. 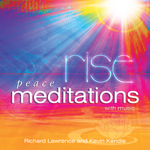 Experience the soothing and uplifting combination of words written and spoken by Richard Lawrence together with music composed and performed by Kevin Kendle – to raise your consciousness and empower your soul. Whether you need to be energised or motivated, or simply want to relax – these meditations will introduce a new paradigm of inner harmony into your heart, mind, and whole being.